More than 4300 Iraq and Afghanistan war veterans who were diagnosed in service as suffering from Post-Traumatic Stress Disorder, but got low military disability ratings, have won an agreement with the Department of Defense to upgrade those ratings retroactively to 50 percent. The higher rating will represent an important win for this group of veterans mentally scared by war. It will mean, from date of discharge, eligibility for disability retirement and access to TRICARE, the military’s triple health insurance option, for the veterans, spouses and dependent children. 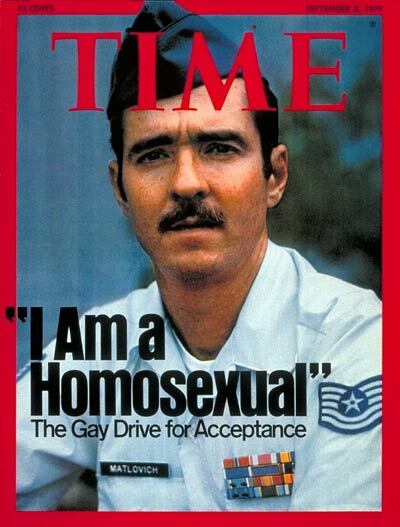 I’ve been thinking and writing a lot about DADT lately, revising my 1990’s chapter. I learned anew about Lt. Leonard Matlovich, who first sued for equal treatment in 1975, and how the friendship he developed with Clinton aide David Mixner —”He was an amazing person publicly and privately,”Mixner told me over email. Mixner, also a pacifist who had organized the 1969 Vietnam Moratorium, had met sympathetic vets while working on the McCarthy campaign, which had a VVAW component; John Kerry and the others were “Like all veterans that come back from any war, a range of emotions depending on the person, their experience and the horror of that war.” But meeting Matlovich and the others persuaded him their battle could also be theirs, and he helped Clinton to try to end the gay ban. The result was DADT – in many ways, far worse than its predecessor. Admiral Mullen and Defense Secretary Robert M. Gates told the committee they needed more time to review how to carry out the change in policy, which requires an act of Congress, and predicted some disruption to the armed forces. MORE study? At last count, there have been at least fifteen major Pentagon studies on homosexual service, some kept secret for years (Google “Crittenden and PERSEREC”) and none of which saw a problem with gay soldiers. Moreover, it’s not considered that revolutionary to talk about it anymore; photogenic folks like Lt. Dan Choi, a latter-day Malkovich of sorts, along with others whose stories are as well-scrubbed and militarist as any proud West Point mom would want. Mostly because (in addition to my admiration of people who volunteer for hard important work) their struggle, up until about now, has thrown fairy dust in the military’s use of an exaggerated, all-heterosexual masculinity to win its wars. Whether that will continue, or what will become of those practices if it doesn’t, is something I guess we’ll all live to see.